The 300 Win Mag is one if the most popular 30 caliber rounds in America. With such accuracy, power, and range, it is no mystery how this round became so popular. 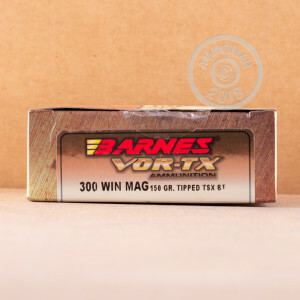 If you are looking for a fantastic hunting or match shooting round, the 300 Win Mag is the cartridge for you. These 150 grain rounds are from Barnes, one of the best manufacturers of premium ammunition. With the accuracy and efficacy of Barnes ammo, you are set for deer, boar, or elk hunting. 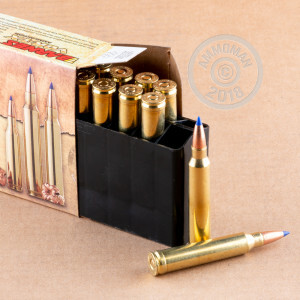 Each round in this box of 20 is loaded into a factory fresh brass casing that comes boxer primed and can be re-loaded. These Barnes VOR-TX polymer tipped TTSX rounds demonstrate consistent expansion and reliable performance, perfect for your next hunting trip.